My sister and brother-in-law have been on an amazing journey. 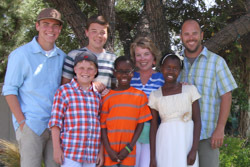 When God called them to be parents, he called them to do so for 3 wonderful boys. But parenting has it’s challenges and for them, the first one came when their oldest son, Brodie, began to show signs of autism at an early age. The good news is, after lots of counsel, tons of help, and endless hours of devotion to the parenting task… Brodie has emerged as full functioning as any of his peers, working in his class without an aid, excelling in school, athletics, and even social skills. When Shannon and I think of Brodie, we think of perhaps the luckiest kid on the planet. He really struck a gold mine in his parents. They have literally bent over backwards to meet his needs both here in the U.S. and literally half way around the world in Uganda. My sister has become some kinda master chef learning how to create pancakes, ice cream, and literally everything you can imagine out of foods that are safe for Brodie and don’t feed his autism. That means saying “no” to pretty much every processed food out there and creating alternatives to baking needs from scratch. In the process of learning and growing and discovering about Autism, they have written an excellent book. 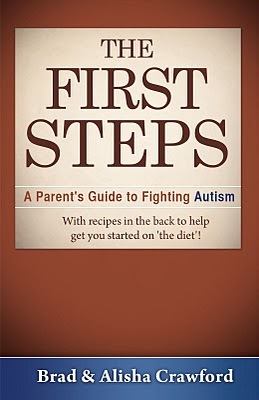 It’s written by parents and for parents, but not as the end-all of autism books. Their hope was to write the book people would read first as parents and friends wrap their head around the parenting task ahead of them when Autism is perceived or has been diagnosed. If you or someone you know has an autistic child, or if you just want to be educated about it yourself, you should pick this book up! Here’s what Brad and Alisha had to say about the book themselves.